Everyone gets a move action and an action, you can sacrifice your action for additional movement but not vice versa. Advantage- if some has the Advantage they roll 2 dice and pick the higher, if they are Disadvantaged the roll 2 dice and take the lower.. I've reposted the scale chart to explain distances, HTML reads my typed version of this chart as code. Armor Points- Some Characters have Armor, unlike traditional Armor Classes, Armor Points used as Damaged Reduction with a static total per battle when they are gone, they are gone. In scenarios with multiple battles, there is an opportunity to repair. Spells may be repeatedly cast as long as a Spellcheck is made testing INT with a penalty of the Spell Level, failing this the spell slot is temporarily lost. Target number for Stat test is ascending . “ i.e you need a 11 to hit”…penalties increase that number so you will see “ +1 Penalty” making the target number harder or “-1 Bonus” making it easier. Often times we state the reverse (-1 Penalty) but mean the same thing. I’ve kept the notations linear in hope of keeping things as clear as possible. 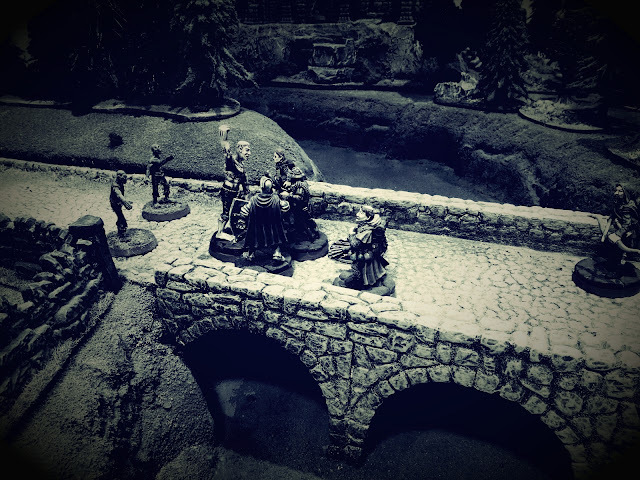 Heroes of the Hall of Tyr, are alerted by the local gravedigger that a Necromancer is raising the dead at the local cemetery and proceed to intervene. 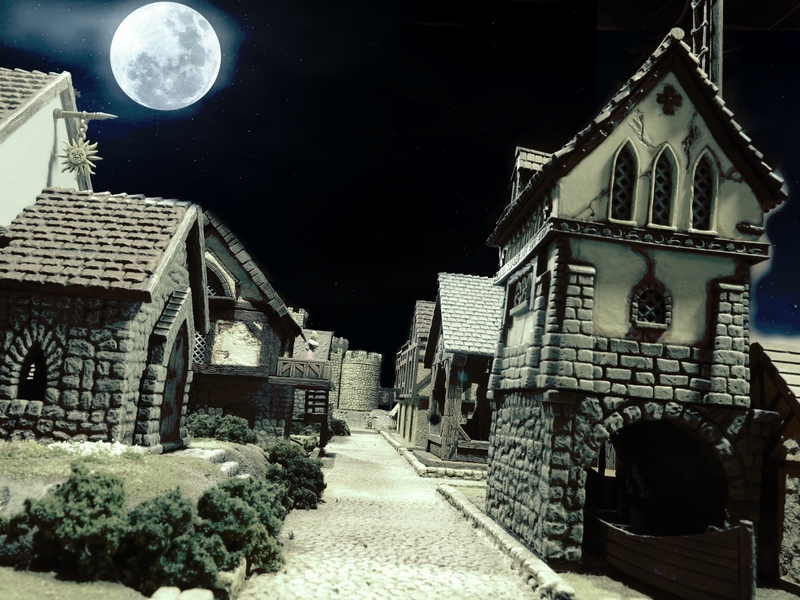 The leader of Cult of Orcus has arranged a clandestine meet with a Mercenary Necromancer to convince him to side with their cause, The Necromancer is currently indifferent to needs of the Cult of Orcus and really just wants to raise some minions for his Cabal. All the heroes test against their dexterity those that fail act after their opponents, here I arrange the main participants in Dice Order, summoned creatures add to end of the order. The Undead Servant under orders from the Necromancers shuffles quickly toward the road to intercept the incoming adventurers. The Necromancer casts Lesser Animate Undead….he summons 3 Zombies and a Skeleton that rise up from the Earth, he then must spell check if he retains the spell and 2 level slot , with a 15 INT, he only needs a 6 but it’s a 2nd level spell so it raise to an 8, he rolls a 12 and keeps the spell in memory for now. 2 Zombies move toward Graveyard Gate..
*Usage Die* are for disposable items..if a 1 or 2 is rolled the die drops to the next lower tier (D10>D8>D6>D4) a 1or 2 on a D4 the item is depleted. Killian The Ranger -eyeing the darkness he can just barely make out the shape of a freshly risen zombie at 12”” (“over there” range) the darkness penalty is +2 and the Zombie also has soft cover for +1 in addition the zombie is 2 HD so an additional +1 for being a level higher than the ranger . Killian dexterity is very high 17 needing only a “4” to hit and despite + 4 to the roll pushing him to an 8.. He rolls a “17” – the Arrow finding it mark no problem damaging the Zombie for 5 Dam. *Charge Rule*- clear unobstructed straight line of sight of more then 6 but no more than 12” to target attacker may move in to base contact 12” as a charge following with an single attack at +2 penalty to hit but also adding +2 to any damage total. The Undead Servant uses the Necromancers INT as its Fight Stat its needs a “8” to charge into Arturus with the Penalty , however since this charge also forces him into base contact with Holger he suffers the additional +1 penalty for fighting more than one opponent.. 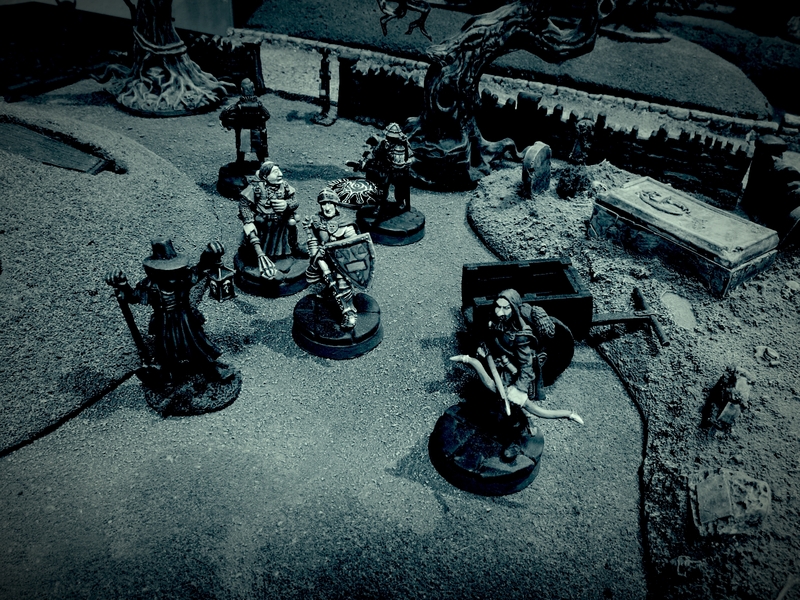 The Undead Servant needs a 9 and rolls a 12 hitting the Paladin for 7 damage total with lowering his Armor points to 5 …. Beleg the Cult Leader remains hidden waiting to an opportunity to strike..
Cristoff moves into combat melee along side Arturus and Holger but must use both his move and his action to do so. Remaining undead shuffle toward the heroes..
1 zombie remains with the Necromancer so he can use it as a shield. His “to hit” is based on his STR of 13 and the base to hit is an 8+, but gets a +1 penalty as the Undead Servant is 3HD..pushing it to 9, However Arturus has 2 allies in the fight each giving him -1 bonus for a total to hit of “7” he Rolls a “9”- a hit resulting in 6 damage. On his Second attack he rolls a “20”! a Critical hit equaling double damage he rolls a “3” for 6 more plus there is a D6 critical hit table, but the result of a “1” yields no extra effect. The Undead Servant has no Armor so 12 of his 17hp are gone a lucky blow could put it down! Killian -Fires an Arrow at the same Zombie as last turn rolling a “2” missing. Holger- attacks the Undead Servant missing it. The Undead Servant- Pummels Holger hitting him with a"16"…The man at arms has a large shield but isn’t using it, as he’s holding the lantern so the 5 Damage punches a hole in his Gambeson wiping out his 2 Armor and doing 3 damage…he has 5 Hp left. *Protection from Good* gives the Undead Servant protection for incoming attacks from good players. Those attacks directed at him all now have a disadvantage. Now his three attackers must roll two dice for each attack picking the worst one..
Beleg, the Cultist Leader- isn’t interested in exposing himself to harm unless he can make an easy kill. If undead start dying..he will flee- in the meantime he stays put. Cristoff the Squire -attacks the Undead Servant his base to is an 11 (10 STR) He gets a -2 bonus for his allies…but +2 penalty because the Servant to 2 levels higher that he(Powerful Opponent) after the Die Modifierts he still needs a 11 but with the Disadvantage from the Spell rolls 2 dice roll a 12 and “2” so he misses. He’s out of the fight for the moment until something breaks..
Arturus The Paladin -Atacks the Undead Servant. We roll 2 dice the results are another "20” and a “14”As the Protection from Good spell is in effect we must take the “14” which is still a hit, the resulting 4 damage is not enough to kill it, but Arturus gets a second attack, the rolls are “16” and “5” we must take the 5 as a miss no doubt this spell has kept Undead Servant in play ,as its almost dead and another hit will surely kill it. Killian- Now has a “over there” shot at 11 inches with the Necromancer standing on the hill. Although his base to hit with his very high (17 Dex = “4”) but we have darkness ( +2) and multiple “ in the way’ and cover issues (+4) so he looking at a 10.
he rolls a “16” to hit so they don’t matter the Necromancer taking a big 7 damage from the Arrow which has the Necromancer reconsidering his strategy. The Necromancer really wants The Undead Servant to put Holger down, as he is carrying their teams light taking it out will limit LoS against ranged attacked and buy his team some time as someone else will need to pick the light up to use it. The Undead Servant -easily smashes him with a but the 4 damage leaves Holger wobbling but standing with 1 HP! Cristoff- no luck for the squire against the undead servant missing. Holger D4 - Fail the light burns out and hell to use a new flask of oil (he has 3)on his action to relight it! Arturus- His first attack rolls are a “14” and “1” being disadvantaged we must take the “1” which is a fumble! (in the dark no less!) .which leads to him ending up being “Dazed” . as a result he loses his second attack and suffers further disadvantage next round. Killian- Climbs up on the bridge wall giving a clear 6” LoS to the Zombies in the rear , its dark but the Zombie at 6” is nearby so he can fire with the +2 penalty he rolls a 14 hits sticking the zombie with a whopping 8 damage ( I should mention here that shooting (not throwing) ranged weapons at less that 6 inches normally gives a disadvantage to the shooter , Rangers do not have this penalty as a class bonus. Holger- Takes a big gamble and withdraw from the combat, he risks a free strike from the Undead Servant, but staying put is riskier . The Servant would need a base 6 but needs a 8 due the penalty of being engage with 3 opponents…he rolls a 6 so Holger escapes relighting the Lantern! Luck! The Darkness, recedes as Light in his lantern blossoms. The Necromancer cast another “Lesser Animate Dead” Spell ..This time he raises 2 more Zombies. 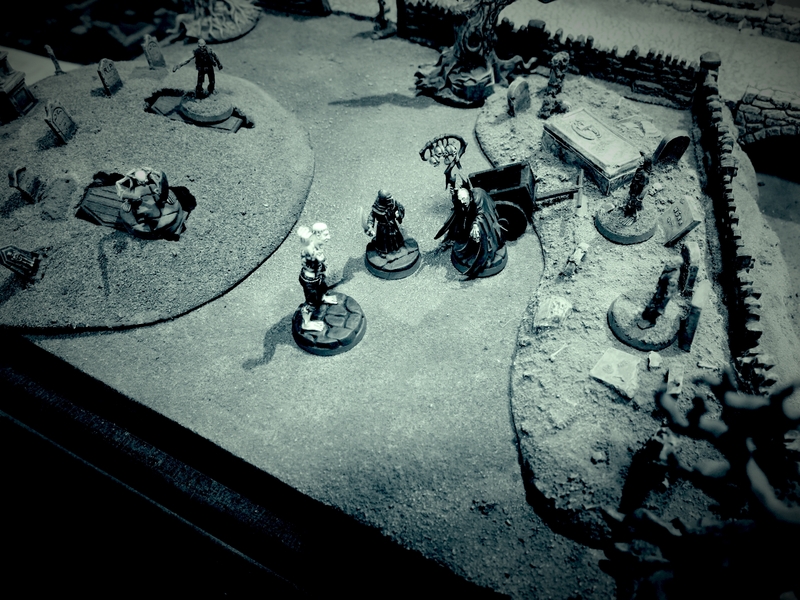 Cristoff attacks the Undead Servant rolling a a ‘15” and “19” being disadvantaged we must take the 15.. He rolls 7 points of Damage destroying the Undead Servant. The Necromancer- Orders his new Zombies to Attack, and his Skeletons to Hold. Arturus- is still disadvantaged . Even thou the Protection from Good on Undead Servant stopped when the Undead Servant died. He's dazed from his fumble last round . He attacks the Zombie in his face and He rolls an "18” but roll again and rolls a “10” which is good enough to hit but only does “1” damage AND being Dazed he only gets one attack. Killian - Moves again off the bridge wall and to his right up onto the hillside, giving him LoS on the opponents at the Graveyard entrance. They just barely on the edge of Holgers light so he can still shoot “over there” with penalties of +6 darkness , powerful opponent, and hard cover..(+2 each) . This turns his easy 4 into a 10…or a 50/50 shot he rolls a 14 sticking the Necromancer for 4 more points of damage leaving him 2 HP which dictating what comes next.. The Necromancer doesn’t really have any healing options, he’ll have to keep that mind next time, this time he orders his Zombies to attack and His Skeletons to follow him off the board and he escapes the battlefield leaving down the road off the table..
Zombie engaged with Arturus attacks…strangely enough this is the 1st time in this melee that a standard HD creature has attacked the Undead Servant being a counted as a “character” standard creatures attacks are rolled defensively by the Character in this case Arturus must test against his own STR to avoid the blow. HD levels above character level are added as a negative modifier, which isn’t an issue here are we have a level 2 character and 2 HD creature..base roll is an “8” or better to defend I roll a “7” so The Paladin is hit, the damage is 4 and the Zombie rips off a piece of his plate armor (The last of his Armor points) but does no physical damage..
Holger- passes any move or action, he stands remaining the light source, and trying to survive with 1 hp..
Beleg the Cultist moves out toward the road, looking for an opportunity or an easy exit..
Harlad attempts to banish the undead again this rolling a 12, the Zombies turn and flee for 4 turns BUT.doing so gives The Heroes of the Hall of Tyr free strikes as the zombies disengage from combat. The resulting rolls cut them dwon, both of are destroyed! The Remaining two Zombie both -uninjured shuffle down the road but are short of engaging the heroes. Holger PASS..whew…didn’t want to go dark right now. Arturus- charges the nearest Zombie with two attacks his impressive rolls of 16 and 19 and damage of 8 then 4 outright kill it..
Beleg, knows he’s done for if he sticks around…he flees unfortunately only getting 1 XP for the battle. Cristoff wants to charge the second zombie all undead cause fear (which the Paladin is immune too) so he must pass a Fear test that is check against his WIS and he needs an “11” he rolls a 12 and charges in hitting the Zombie and doing 7 damage..
Arturus- now lays hands on Holger healing him 5 points….the group continues to graveyard to look around. 1 XP for each team member for no one being knocked out of action. +3 for each Undead raised safely off the board. Beleg, Cult leader, a bad day for him be he saw no point in risking himself any alliance with the Necromancer went nowhere 1XP..
After the battle, the less conservative members from the Hall of Tyr celebrate after their victory. So that's it for Episode one, I realize the battle was somewhat uneventful, alot to this was just getting a feel for the rules..it played pretty smoothly without alot of head scratching and rule look up, definitely doing the next one with this ruleset, While the Necromancer will surely be back at some point, Next time well look at some of the other factions in Blackbarrow, More terrain spotlight and painted models to come as well. 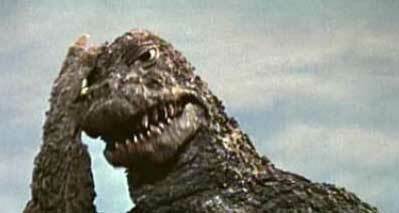 Let's start the New Year out right with a Godzilla sized facepalm, Mea Cupla . I got a text from my friend Tim out in AZ about the last blog post and the comments. mentioning to check about notifications for publishing them. I did ,and found a couple things. First of all blogger seems to changed the way it notified me about pending comments, I was used to an alert posting in my main feed where you see the overview of your blogposts. that seems to have changed and I missed the memo on said changes. Coincidentally-this must of happened in fall of last year right when my reader comments stopped. when I clicked on the "awaiting moderation" sub menu of "Comments"...I found 35 unpublished comments since the fall of 2016!, Wait you ask! what about email notifications for comments ?? yes, but it had my old comcast email address, (which is long long dead) in there that I swear to god I freaking changed!! So, I am a moron. However its been corrected..And if you commented in the last year, or didnt and just read the blog. I want you to know That I appreciate it thank you!. having that said, it doesnt change my commentary from the last post although from a personal standpoint, I'll roll back the bleakness just a bit.